The Lexus HS 250h was the luxury brand's first-ever dedicated hybrid, a car with no conventional gasoline model. Launched for 2010, it has failed to live up to its sales expectations and has generally received weak reviews. 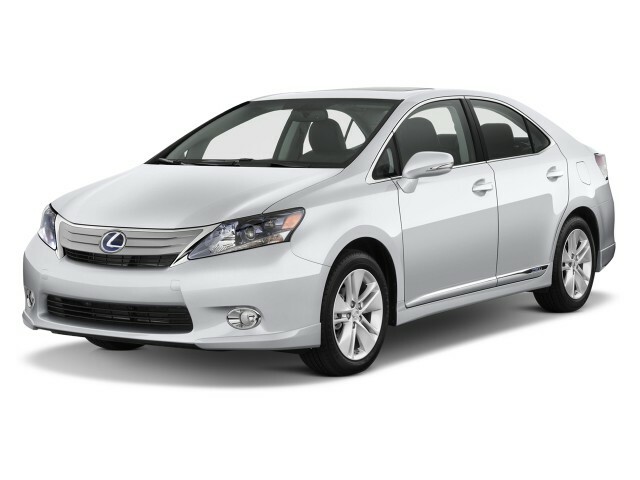 It is powered by a version of the hybrid powertrain used in the larger Toyota Camry Hybrid, with a 2.4-liter four-cylinder engine mated to Toyota's Hybrid Synergy Drive system, which uses a pair of motor-generators that can power the car on electricity alone under light loads at low speeds, add torque to the engine's output, and recharge its nickel-metal-hydride battery pack. Total combined output of the engine and motors is 187 horsepower. The HS 250h is a tall car with a very high cowl, giving it slab-sided styling and a blunt front with a long overhang. Unusually, its best angle is the rear three-quarter view, where the trunklid, rear lights, and shoulder line come together in a pleasing blend. Inside, the view out is restricted by the high beltline, and the cabin is narrower than passengers might expect. Its futuristic center stack and console sweeps down from the dash, and it has the same small drive selector as the Prius. The mouse-like controller for the optional Lexus Remote Touch system that controls navigation and stereo sits under the driver's right hand on the console, and proves relatively intuitive to use. Compared to the hybrid Toyota Prius, the Lexus HS weighs about 600 pounds more, so despite its larger engine, the performance isn't particularly stellar. The engine seems to switch on more than it does in the Prius, and the HS is surprisingly noisy inside. Under hard acceleration, the engine rises to a howl while struggling to move the heavy car forward, and the second-smallest Lexus lets in a lot of wind noise--more than you'd expect from its luxury trappings. Handling is particularly vague, with utterly lifeless electric power steering and a more jittery ride than a Lexus should have--perhaps due to the short wheelbase. The car rolls a lot on sharp turns, and during our test, we actually had to switch off the radar-based adaptive cruise control because its beam wasn't wide enough to follow the car ahead around those turns--leading to sudden, startling bursts of acceleration followed by hard braking. But the biggest drawback to the HS 250h may be its gas mileage. Rated by the EPA at 35 mpg combined, it's lower than any of the hybrid mid-size sedans, including the Ford Fusion, Hyundai Sonata, and Toyota Camry. All of those cars have lower base prices, and while their lists of luxury features don't match those of the Lexus HS, they offer more interior room and in some cases, a much more engaging experience behind the wheel. Lexus buyers expect lots of equipment, and the HS delivers on both standard featuers and high-tech options. The technology starts up front with the all-LED headlamps, which are part of an adaptive lighting system that points the beams around corners for better visibility. They also have their own washers, and the car dims the high beams automatically. Then there's that adaptive cruise control, a very good heads-up instrument display for the driver, front- and rear-view cameras, lane-keeping assistance, and the Lexus automatic park assist system. And more beyond that. In the end, the Lexus HS 250h is aiming for a laudable goal: It wants to be a high-efficiency compact sedan with all the luxury of a Lexus. It's disappointing that the result falls short of the mark, but the market has apparently passed judgment on the HS, as it's one of the lowest-volume mass-market cars in the Lexus lineup.